Another woman has come forward accusing Rep. John Conyers (D-MI) of inappropriate sexual behavior hours before the longest serving member of Congress is set to make an announcement about his political future. Elisa Grubbs said that the congressman put his hand up her skirt and rubbed her thighs while sitting in the front row of a church. “Rep. Conyers slid his hand up my skirt and rubbed my thighs while I was sitting next to him in the front row of a church," she said in an affidavit published late Monday by her attorney Lisa Bloom. "I was startled and sprang to my feet and exclaimed, 'He just ran his hand up my thigh!' Other staffers witnessed the event." Grubbs worked for Conyers for more than a decade. She is also the cousin of Marion Brown who also accused the congressman of sexual misconduct, reaching a confidential settlement with the politician over the allegations. As well as touching inappropriately in a church, Grubbs claims she witnessed Conyers touching and stroking the legs and buttocks of her cousin and other female staffers on “multiple occasions,” adding that such harassment “was a regular part of life while working in the office of Rep. Conyers." In another instance of sexual harassment, Conyers allegedly came out of the bathroom naked knowing Grubbs was in his home. Conyers is set to discuss his political future and the allegations against him on a Detroit radio show at 10:15 a.m. His attorney, Arnold Reed, said the 88-year-old congressman’s health will be a deciding factor. 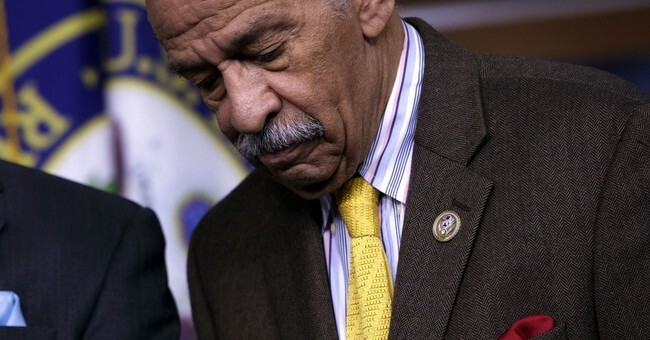 Conyers was hospitalized last week over a stress related illness. According to a New York Times report, the congressman plans to retire, not resign.